This Y-Shaped Peeler from Kuhn Rikon quickly removes skin from fuzzy or smooth-skinned fruits and vegetables. It will not slide around or skim over the top like your regular, straight blade version does, so it will reduce frustration as it helps you to prepare better looking food in a shorter amount of time. The super sharp blade has added teeth that dig down to gently grip and lift up skin to make peeling easy, and slipping nonexistent. A slight pivot will occur as you move along the surface to conform to rounded shapes, and remove large pieces with each pass. The design is usable by right or left-handed people, and the ergonomic handle is has a slightly squishy coating to make it comfortable to hold for long periods of time. Completely dishwasher safe when it is in need of cleaning, and an integrated hook gives you options for storage. Also works for regular stuff like potatoes and apples too. Using this tool is pretty simple and straight forward. The long ergonomic handle has a comfort grip coating to reduce strain and increase usability. The Y-Shaped, harp styling is easy to use, but also makes it good for left or right handed people. If your regular, straight blade peeler isn't cutting it, then try this one to quickly remove skin on more complicated foods. Hold your peeler with your dominant hand, and cradle your food in the other one. Position blade on food and apply downward pressure. Slight pressing will cause the teeth to break the skin so you don't slip while peeling. To peel use a pulling motion and work from top to bottom or front to back. When peeling horizontally, make sure to pull away from your body for safety. Continue peeling and rotating your fruit or veggie until the desired amount of skin has been eliminated. The blade will pivot as you move to conform to rounded surfaces and allow you to remove the maximum amount with each pass. Peels will fall down, so work over sink, bowl or trash for collection and easy clean up. After you finish, place in dishwasher or hand wash to clean. Prefer one with a slightly different handle? Kuhn Rikon also makes this tool in a swivel style peeler. For a different blade orientation, and a design that some people like better, check out the Swivel Style Piranha Peeler. Like your tools made from metal? We also carry the Star Serrated Peeler, and it has a steel blade and handle. Uses Peel the skin from fuzzy or slippery foods. Y-Shaped Kuhn Rikon Piranha Peeler - An effective tool for removing the outside of fruits and veggies that have fuzz, or ones with shiny skin that is slick. Perfect for kiwis, peaches, tomatoes and more. Order Yours Today. 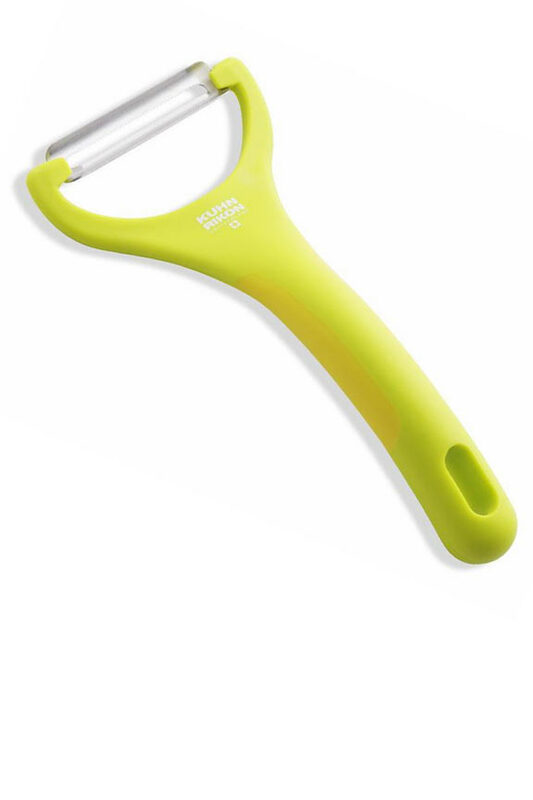 This is a pretty good peeler especiall for large vegetables like eggplant. Very sharp! I love it. It was exactly what i wanted and it works great. I use it to make zucchini ribbons and then wrap it around fish with fresh basil . Thank you. This little peeler is a gem. It just glides over potatoes, sweet potatoes, apples, carrots,etc. I am very happy with it. I have never found a peeler I liked better than my 25 year old metal peeler, until now. My husband kept bugging me about getting a new one, so after a lot of research by him, he found this and I couldn't be happier. Buy one today. You'll love it! Ergonomically designed, sharp, and fast peeling. We purchased the red Kuhn Rikon Piranah Y Peeler about a month ago and have used it on a variety of fruits and vegetables. It is light weight, comfortable in your hand, easy to use and easy to clean. We anticipate peeling lots of french fries with this Piranaha peeler. Quick and acurrate, thanks the item is wounderful. I bought my first one several years ago, and I was so happy with it. So good, I just bought two more at a much cheaper price than my first. Can't go wrong with this one! I purchased one of these over a year ago on Martha's Vinyard. My coworker loved it and I got her one several months later on a return trip. Then another coworker tried it and I had a hard time getting it back from her, so I looked around till I found it offered on this site. I bought another one for myself and one for her. Then my first coworker ordered 6 more of them for her family. This peeler is the best bar none. It will peel hard or soft fruit and vegetables with ease - and you can't beat the price. Is this peeler made in Switzerland or made in China with so called "Swiss design"? This one is made in China. We carry others that are still manufactured in Switzerland, so give us a call if you need help placing an order, or finding what you're looking for. Two Fruit and Vegetable Peelers in One. A Razor Sharp Blade For Zero-Resistance Peeling. Minimize Browning.